Investigators examined the possible direct association of thyroid traits on atrial fibrillation. Low thyrotropin as an early sign of an overactive thyroid gland and a concomitant increase in the standardized triiodothyronine (FT3):free thyroxine (FT4) ratio were genetically associated with atrial fibrillation (AF), according to study results published in JAMA Cardiology. Observational studies have demonstrated that increased FT4 and decreased thyrotropin are associated with an increased risk for AF, but, the parameters of this association are not clear. 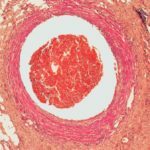 Using Mendelian randomization, researchers explored whether FT4 levels within the reference range, FT3:FT4 ratio, thyrotropin levels within the reference range, hypothyroidism, concentration of thyroid peroxidase antibodies (TPOAb) or hyperthyroidism may be on a causal pathway for AF. In 55,114 individuals with AF and 482,295 referents from 11 cross-sectional and prospective cohort studies of European ancestry, the researchers found that a genetically increased FT3:FT4 ratio and hyperthyroidism were associated with an increased risk for AF, and that thyrotropin within the reference range and hypothyroidism were inversely associated with a risk for AF. Thus, the pituitary-thyroid-cardiomyocyte axis was implicated through these significant gene-based effects on AF of the FT3:FT4 ratio, hyperthyroidism, thyrotropin, and hypothyroidism, the latter largely limited to instruments with effects on thyrotropin as opposed to autoimmune function. However, there was no support for direct involvement of FT4 within the reference range or thyroid peroxidase antibody levels in AF. Should CHA2DS2-VASc Be Reassessed More Frequently to Improve Stroke Prevention in Afib?